Growing up in different parts of beautiful British Columbia has been an adventure from the get-go for Sarah. Born in the sunny Okanagan and then relocating to the East Kootenays with her family of eight (her parents along with four brothers and a sister). She was raised on family camping trips in the mountains and building forts in the yard. As a kid she played organized sports but eventually found a serious love for recreational hobbies such as climbing, biking, hiking, fishing, skiing and photography. It was the fall of 2011 when Sarah felt an itching. The wind was changing and something new was brewing! Sarah had spent most of her young adult years working at a forest education camp in Canal Flats, B.C – Blue Lake Forest Education Society was an amazing place to nurture her love and appreciation for the outdoor world. It was a 25km drive up a windy logging road to the beautiful camp. There came a point, a few years after graduation, that she decided it was time to move on from making minimum wage, playing dress up and having campfire songs stuck in her head. So she sat down in the old camp office and with the little Internet and a promise of finding something new Sarah eagerly opened up a new web page. With the happy Google logo staring back at her, she began typing “some place on the B.C coast with mountains…” and then ENTER! As the slow connection began to search she felt her excitement building. Soon the page began to work! And suddenly Squamish BC popped up. A mysterious land of ocean and rock; a place that she had only dreamed of! Today, Sarah works as a Park Ranger, preserving the beautiful BC landscapes. 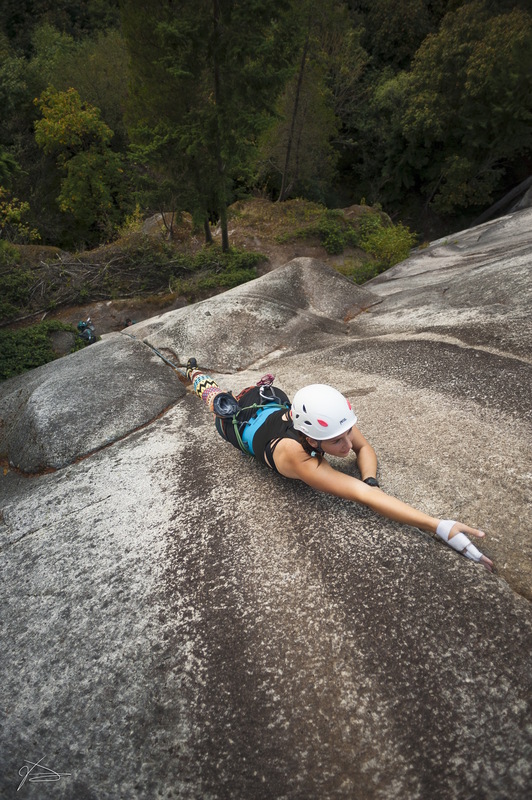 She volunteers her free time with Squamish Search and Rescue. She also loves to paint mountain landscapes in her spare time and eat loads of peanut butter. Currently Sarah is an ambassador for GoPro, Redbull and Arcteryx. She explores with her trusty dog, Doc and enjoys simply living in the moment.